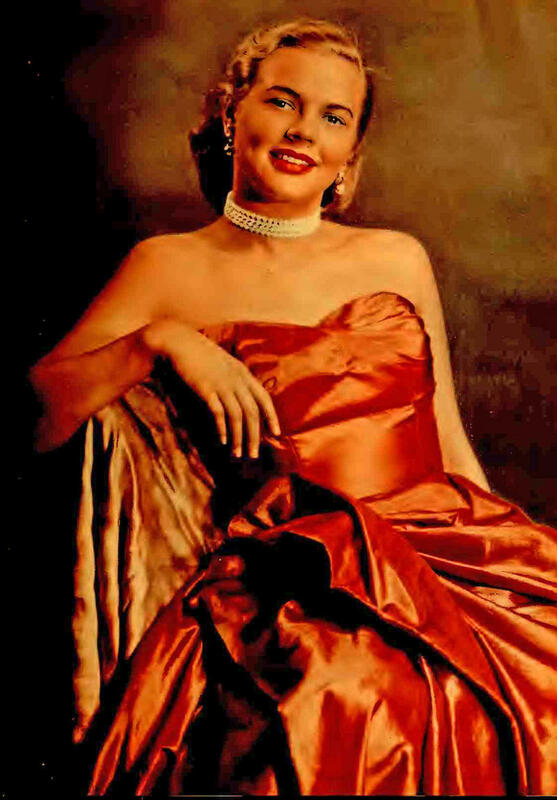 Sis Camp (Pohlkamp) as she appeared in the September 1953 Radio-TV Mirror magazine. 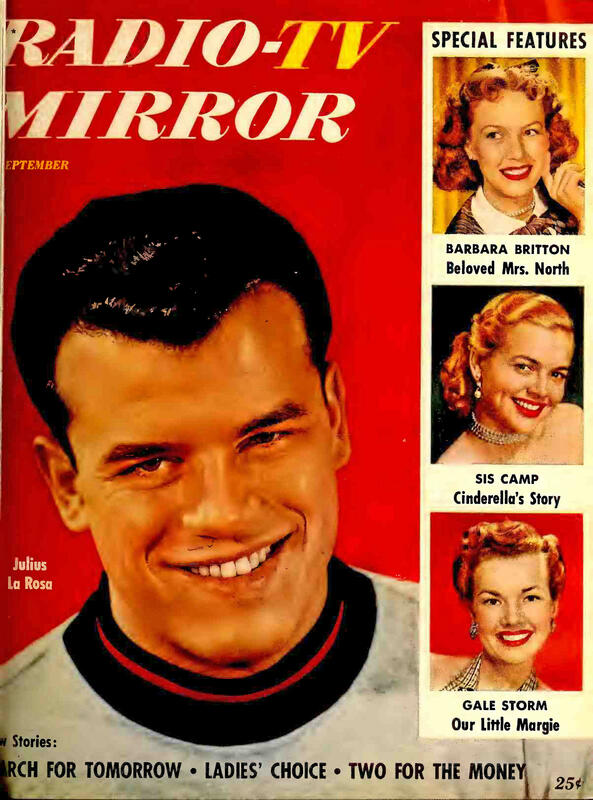 Sis Camp was on the cover of the September 1953 Radio-TV Mirror magazine. She was "Sis Camp" when the DuMont network broadcast WCPO-TV's "Paul Dixon Show." She appeared in the Chicago Tribune and in a Radio-TV Mirror magazine cover story in 1953, her first full year with Dixon. The life of St. Bernard's Loraine Pohlkamp, a local model, changed in November 1952. Dixon called and asked her to be a regular on his weekday TV show as Dotty Mack was leaving for her own show. Dixon needed someone who could pantomime to records, which is what they did on the live show back then. They gave her the stage name of Sis Camp, and immediately hired her to join Dixon; producer Len Goorian; and Wanda Lewis, wife of "Uncle Al" Lewis and later known as "Captain Windy" on WCPO's long-running "Uncle Al Show." 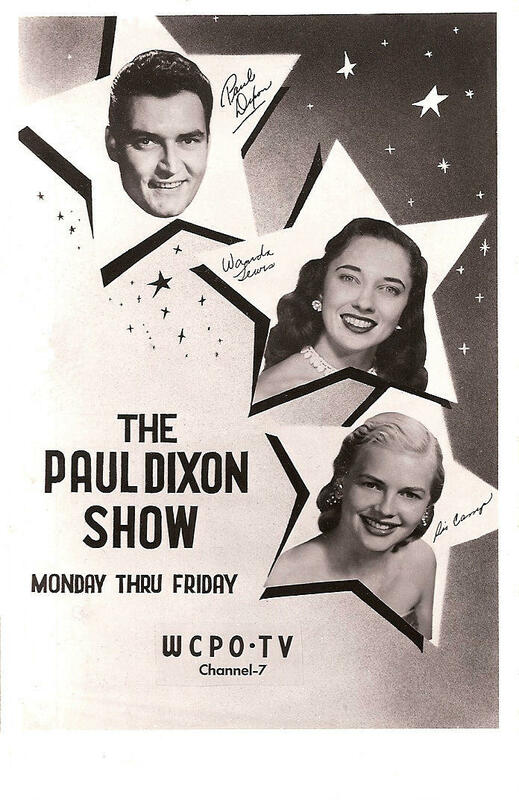 Print advertisement for WCPO-TV's "Paul Dixon Show." Son Steve Wolf, CBS college basketball analyst and former Xavier University star, knew all about his dad going from coaching basketball at Villa Madonna (now Thomas More College) to the Royals with Oscar Robertson, and the NBA Detroit Pistons, in the 1960s. Robertson, Dave Cowens, Adrian Smith, Bob Cousy were always coming over to the house. So did Al and Wanda Lewis. Steve just knew they were his parent's friends. 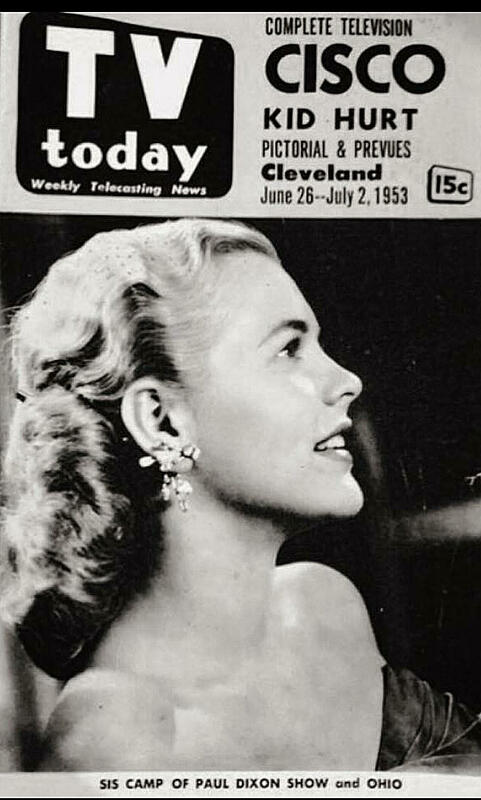 TV Today Cleveland edition in 1953. "I had no idea my mom was Sis Camp," Wolf told me last year, pointing to a photo of his mother with movie star James Cagney at his home. He didn't know, because she gave up TV stardom to marry Charley Wolf and start a family. "Here’s the story, you’ll love this. Mom and dad meet. My dad’s making 'low' money coaching Villa Madonna. And my mom is making probably in dollars today what would be close to a quarter million dollars. Big money. "So they broke up, and made a novena (a nine-week prayer). When 10 weeks were over, she decides she wants to get married. 'I worked hard for my career, but I’ll let it go. No more modeling,' she said." They married in 1956. "A few years later he got the Royals job and made enough money." "Cinderella Sis Camp" story in Radio-TV Mirror. 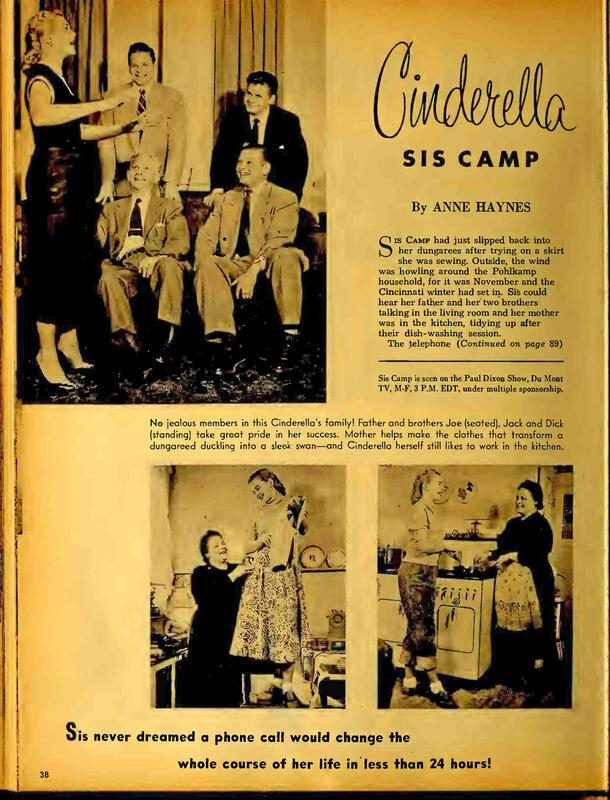 The 1953 Radio-TV Mirror story, called "Cinderella Sis Camp," said her mother "helps make the clothes that transform a dungareed duckling into a sleek swan—and Cinderella herself still likes to work in the kitchen." The story said Sis had "no years of singing instruction, no years of dancing school, no years of dramatic productions." "Paul Dixon" aired on DuMont until April 1955, according to the "Complete Directory of Prime-Time Network and Cable TV Shows." Dixon moved to New York briefly, and returned to Cincinnati in 1955 to work for rival WLWT-TV until his death in 1974. Mass of Christian Burial for Sis Wolf will be 11 a.m. Wednesday, June 7, at the Church of the Nativity of Our Lord, 5935 Pandora Ave., Pleasant Ridge. Visitation begins at 10 a.m. Survivors include her husband Charley, and sons Marty, Steve, Greg, Jeff, Dan and David Wolf. When the obit is posted, I will link to it here. Here is the link to her obit. UPDATE WEDNESDAY MAY 31: This just in from Jennifer Schack: "I can finally talk about my new job. I am working for the Diocese of Covington in a new role titled, New Media Correspondent. I work under 'The Messenger' staff, and will focus on online digital content for the diocese, as well as reporting for the weekly diocesan newspaper. "I'm excited to share my faith in my work. I'm an active member of the St. Joseph Cold Spring parish, and as you've mentioned a Bishop Brossart High School and Thomas More College alum. I think the work will be a natural fit for me as I transition out of the TV business."